Want to give your dog a snazzy collar without the spendy price tag? Making a fabric from scratch is easier than you think! If you know your way around a sewing machine, you can whip up a collar in under an hour, and customize it with fun fabrics however you’d like. From fun, to elegant, to just plain soft and comfy, handmade dog collars are a great way to give your dog big style on a small budget. The collar has three metal/plastic components, which you can buy individually at a hardware store, or save a ton of money on by buying online at Amazon.com. You’ll need a 1” Side-Release Buckle, 1” Tri-Glide Slider, and a 1” D-Ring. To buy these all together as a set, visit this Amazon link. Fabric of your choice. This is the fun part, so select a fabric that you love! I would recommend standard cotton fabric like mine, or even a rich upholstery fabric (nothing too heavy). Just don’t get anything stretchy like spandex, or anything that will dig into your dog’s neck with sequins, etc. You can purchase a very small amount of the fabric (1 foot, or even ¼ of a yard will be plenty). Coordinating thread that matches your fabric. Spread out your fabric on a clean tabletop and measure across the long width of the fabric. This collar will fit a medium-size dog – I cut my fabric to 31” in length to make a collar for my 50 pound Australian Shepherd, and that size worked perfectly for him (remember, we are making an adjustable collar). Because we are using a 1” buckle in this tutorial, suitable for medium to large dogs, I would recommend cutting your fabric between 30” – 34” in length. Once you have your fabric panel cut to your desired length, it’s time to cut out two identical strips of fabric from your panel, each two inches wide. Use a scissors, rotary cutter, or a simple tear (if you are using 100% cotton fabric, you can simply make a small snip at the edge and then tear a perfectly straight line) to get two strips of fabric. In this photo, my strips are 31” long by 2” wide. Place your two identical fabric strips together, with the brightly colored “right sides” pressed together inside the sandwich. We’re going to sew them together, and then right-side out the tube that is formed. Since our fabric strips are 2” wide, and our buckles, sliders, and D-rings for the collar are 1” wide, we want to sew the fabric strips together right now in a way that will make the fabric of the collar 1” wide when it is right-sided out and pressed with the iron. Meaning that we should have a ½” seam allowance on either side, with 1” of fabric in between, as you can see in the picture. If I were to make this collar over again, I would make that middle area just the teeny-tiniest bit bigger than 1” – the reason being, that when everything is right-sided out and pressed, the middle loses a little bit of width, and doesn’t quite fill the entire width of the buckle. But I’m talking about a really really, teeny-tiny amount (I’m a perfectionist, haha). If you don’t care, don’t worry about it, but if little imperfections like that make you crazy, then just add about ⅛ of an inch to that inner section of fabric (so that it’s 1 ⅛ inches wide). Once you have sewed a line down both sides of your fabric sandwich (leaving the ends open – don’t sew across those! ), it’s time to right-side everything out. I’d recommend using a safety pin to do that, by pinning it to one end of the fabric, and pushing it through the “tunnel” to the other side. When you’re done, you’ll end up with a wrinkled, snaking, tube that doesn’t quite resemble anything like a collar yet. That’s where the iron comes in! With just a few minutes of straightening, tugging, and iron-pressing, you’ll take your round, wrinkly tube from floppy to flat and crisp. Once you’ve ironed everything, let’s address the ends of your fabric collar. Fold the ragged edges inside, and do a simple stitch line across the end – remember to back stitch a few times. Do this on both ends of the collar. Phew! Well, the most labor-intensive part is over, and now we have some simple assembly to do. Let’s start with the tri-glide slider. Feed your fabric collar up through the bottom, over the crossbar, and down through the other side, as pictured in Step 6. Leave about 1.5” of fabric sticking out of the end – that will be the tab that we sew down in the next step. Sew that 1.5” tab down to the collar using a box stitch. A box stitch is pretty much what it sounds like – it’s a stitch pattern that is a box with an “X” through it. Simple and secure! Take a look at the photo for Step 7 to see the simple pattern. Now that you have the tri-glide slider sewn into place, let’s move on to the male end of your collar. Feed the fabric up through the bottom of the side-release buckle (the male side), up over the crossbar, and back down through the back. Notice the orientation of everything in the photo for Step 8. Using that same end that we just fed through the side-release buckle, go aaaaall the way back around the outside of the collar until you come to the tri-glide slider again. Feed the end of the fabric up through the bottom, over the crossbar, and back down and through the other side. Also notice that you’ve just hidden the box stitch area that we did a few steps ago. That box stitch is now hidden inside the collar, which is lovely! Almost done! Slide the D-ring into the end of the fabric, and then slide the female end of the side-release buckle on, as well. Don’t worry about where the D-ring is flopping around for now – we’ll take care of it in step 12, coming up next. Use a simple, straight stitch to secure the female end of the side-release buckle in place, once again remembering to back stitch a few times. Now for one more box stitch to finish off the collar! Pull the D-ring up towards the buckle as far as possible, until it is pressing against the seem that you just sewed in Step 11. Drop your presser foot right next to the D-ring, and position the needle all the way to the right. The photo shows my left needle position before I moved it over to the right, but don’t be thrown for a loop – move your needle as close as you can towards that D-ring for a nice, tight stitch. After you’ve done the final box stitch, trim everything up, and you’re done! Now you can walk your dog in style with their handmade, eye-catching collar. Did you enjoy our personalized dog collar? 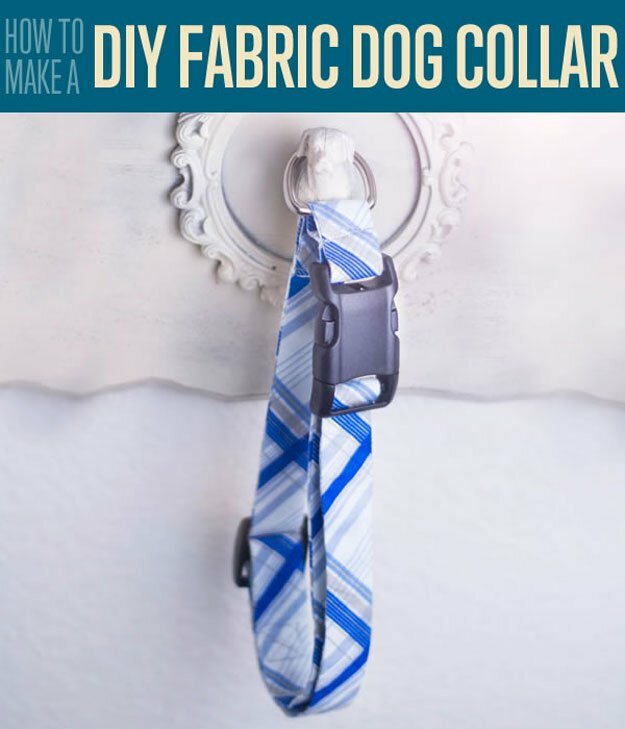 Let us know in the comments section below what your thoughts are on this cool dog collar project. Do you have any other pet projects you’d like to share? Share it with us and we’ll give it a try. We love doing cool DIY projects by making craft projects, home decor projects, upcycling ideas, recipes, tutorials and anything you can do yourself. That’s why we created this site, we want people to be more in touch with their creative side and realize that there’s a lot of things that they can do themselves. We’d love to hear from you and create a community of DIY enthusiasts where any project is just a click away. Stay connected with us on Facebook, Twitter, Pinterest and Instagram! What is the length of the cost when it is totally finished? I know it says medium sized dog but I would like inches, thank you? THANK YOU!!! I felt so stupid having so much trouble getting the hardware to work right. I had nothing to go on and gave up. I found this and can’t wait to go back and try again. Your directions are so clear and the pictures help a great deal. Thank you again for sharing this. Thank you for taking the time to share your feedback. I am very glad that you have enjoyed the information we have shared. We have passed on your comments/suggestions to the correct department in order to improve our service. Spread the word! If you have any other questions or concerns I would be happy to help. I made this in less than an hour from scrap fabric and the hardware I had saved from an old, worn out collar. My 15 lb. Jack Russel mix needed a smaller collar than these directions, but I used one of his collars as a model. It looks great and he pranced around as if he knew he looked good. This will be really cool and comfortable for him in our insane Arizona heat. Thanks for the idea; I will never need to buy another collar. I’m so glad to hear that this article was helpful, Christy. If you have pictures of your pooch and his DIY collar, please post.